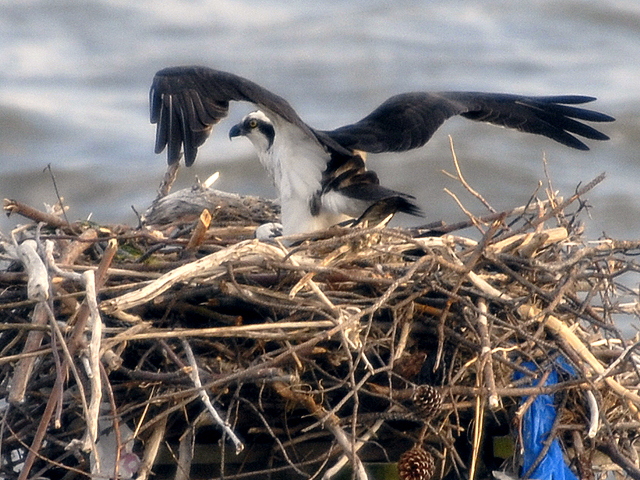 We Have an Osprey Hatching! It appears we have some exciting activity occurring within Oliver & Olivia’s nest! 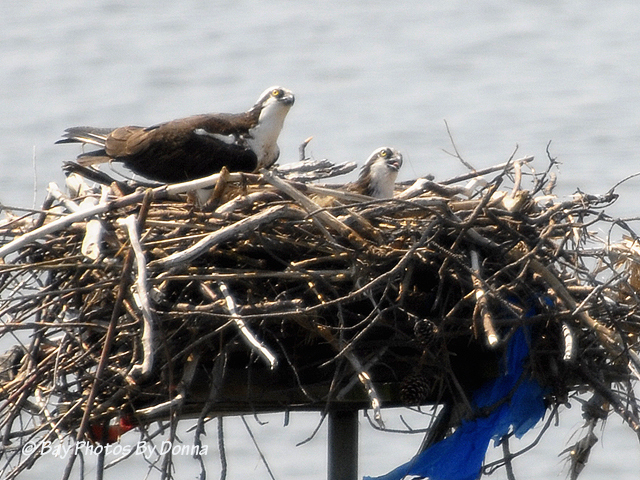 Their first egg was laid on April 2nd, with incubation taking approximately 36-39 days. Up until this past Friday, all seemed basically normal. But Saturday late afternoon through this evening, I’ve seen both Olivia and Oliver being very interested of their nest within, getting up and inspecting their clutch often from the side of the nest. 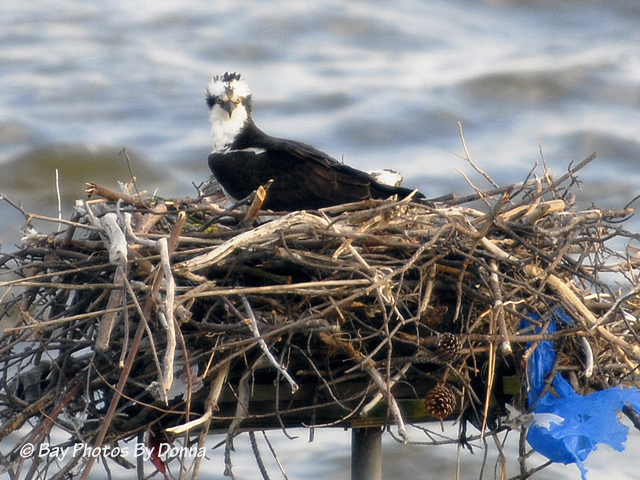 They are also constantly picking at the nesting cup materials, rearranging it some as if to keep in place and secure. 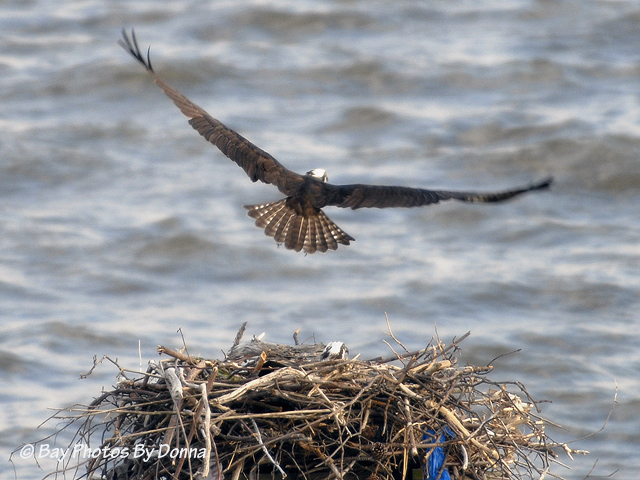 In addition, neither parent is too keen now on anyone walking by the nest, they begin to chirp. So I feel confident to say we have had a hatching! 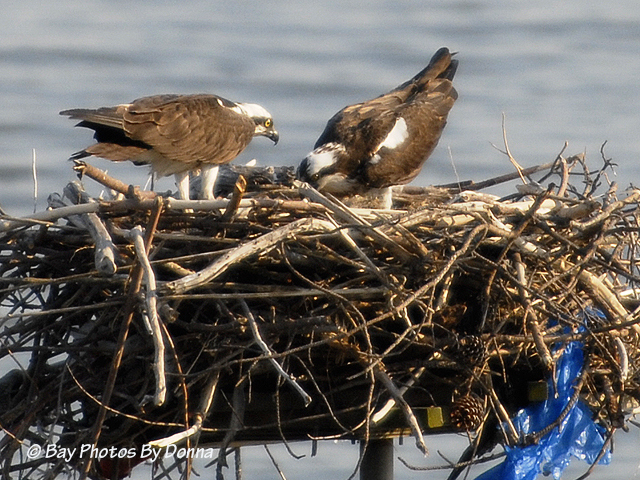 If there is more than one egg (and we hope so! 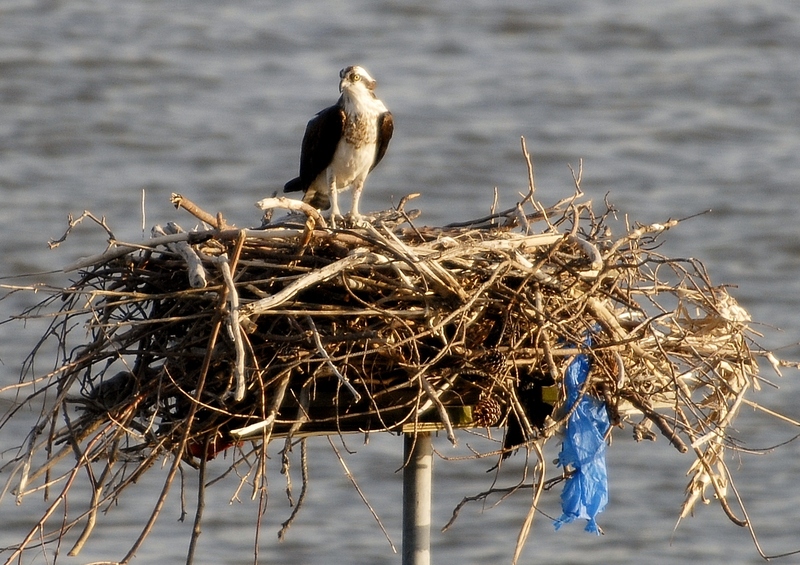 ), they will hatch in sequence of laying about 3-5 days after the first one. It will be a week or so before we might possibly see a little chick’s head popping up for a feeding or a look. That will be my challenge to capture! I have a few photos to share from the last few days, the first one has Mr. Oliver giving me the stare down, while the wind behind gives him a stylish mohawk. 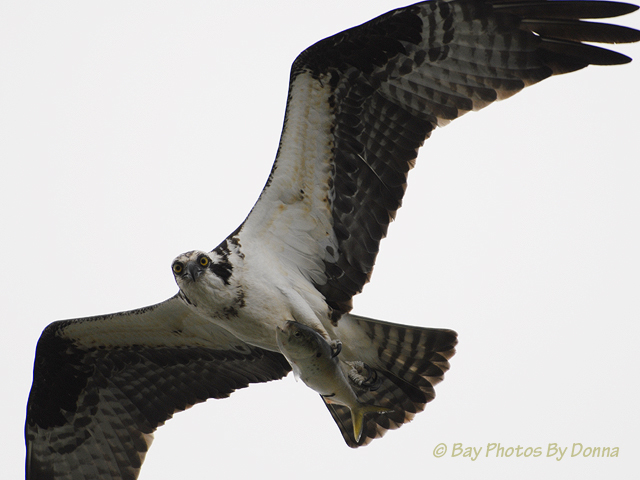 The next photo is Oliver at take-off and gives a great shot of an adult osprey’s wingspan which is 4 1/2 to 5 1/2 feet, the female’s being the largest. I’ve noticed in the last couple weeks, Oliver landing on Olivia several times as if to mate. He wouldn’t continue but just stayed still on her a few seconds and then would lift up & over to the side of the nest while Olivia would reposition herself onto the clutch. I was wondering if it was a sign of affection or bonding between the two. Here’s one of those instances. 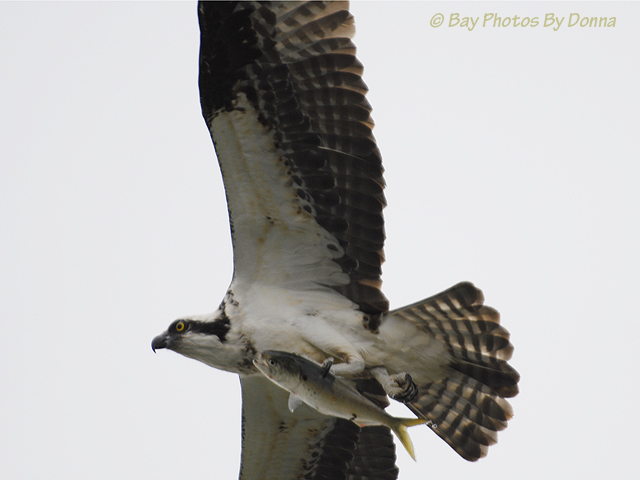 With the immediate area having two new osprey pair soaring around as well as the occasional eagle, both Oliver and Olivia keep their eyes on these “intruders” as well as pursuing them with aerial chases as they protect their home and future family. This evening as the sun was setting and Oliver had just departed the nest from his clutch-duty, Olivia actually perched a few minutes to soak in the warm rays and do a photo shoot before positioning back on to her future family. You’re doing a great job, mom! 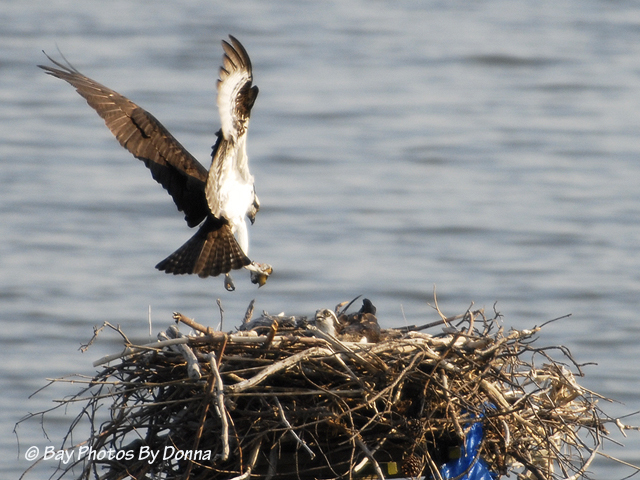 Stay tuned for our little ones as they grow from helpless 2-ounce chicks to soaring acrobats in just eight amazing weeks! 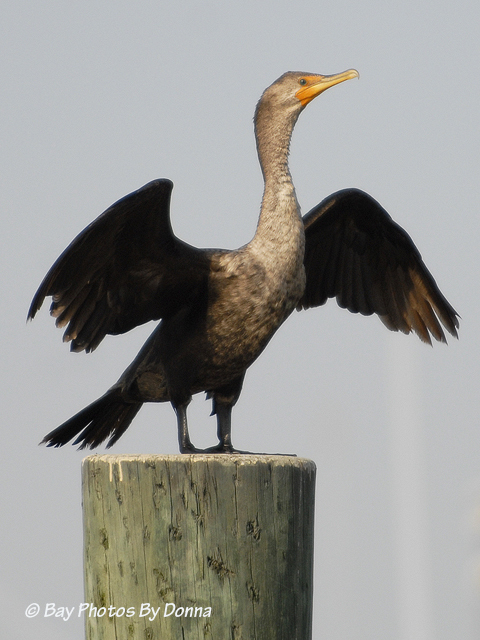 Finally, a shot of a young cormorant I saw over at Mears Point Marina who was also soaking up some sun-rays.